The lamb Gyro was very tasty. Adding the tzitikiki sauce enhances the flavor. A batch of fries for an additional $1 still makes lunch from ATIP cheaper than most of the other food trucks. I had heard about them from a fellow co-worker (I was a bit weary about trying the food trucks that park out front). To my satisfaction though, it was delicious... The lamb as juicy and favlorful, granted this was the first one I ever had in a tortilla but it was absolutely delicious. The portion size was just perfect for a lunch and for a dollar more you could add fries! I also did enjoy it was an even 6 dollars which you can't beat. They were my first food truck and I will be definately going back! The gyro meat was quite tasty...although I would have preferred my lettuce to be more shredded than it was. The wrap itself didn't seem like it had been warmed or anything and I saw them take it straight out a bag so don't expect some freshly made pita. I would eat here again though because the meat is very flavorful. They give samples of both the chicken and the lamb. Not bad for $8 and that includes fries and drink. It was more like a chicken taco than chicken shawarma...for a place that is PITA spelled backwards, I was expecting good quality pita, not a tortilla. I was hoping it would be good too...I love Middle Eastern food. 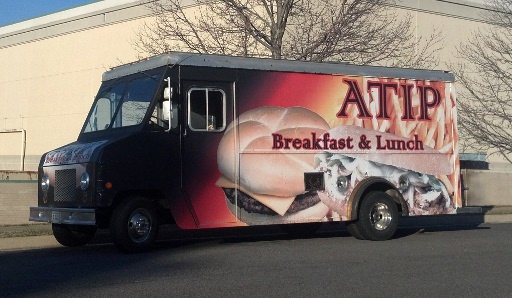 ATIP is a Mediterranean cuisine food truck serving in Fairfax, VA. Menu items include shawarma, hummus, falafel, pita, tabouleh, etc.